Mark Wellman is a nationally acclaimed author, filmmaker and motivational speaker. Despite being paralyzed in a mountain climbing accident, Mark has inspired millions to meet their problems head-on and reach for their full potential. A two-time Paralympian and former Yosemite Park Ranger, Mark’s NO LIMITS philosophy encourages individuals to adventure into new horizons; to go beyond the seeming unreachable. Mark is used to being on the road since he travels throughout the year, bringing his adaptive climbing wall to companies, organizations, and schools. We caught him during one of his road trips and he agreed to swing by Golden, Colorado to the No Barriers podcast studio and catch up with his old friends, Jeff, Dave, and Erik. Mark is unbelievably accomplished but also reserved and humble. He talks about his legendary, groundbreaking athletic achievements with the same tone most use to describe what they had for lunch. But there was a time in Mark’s life where he was unsure, depressed, and hopeless with no clear path ahead. Mark discusses his near-death injury that he sustained on a climb that left his paralyzed from the waist down. He spent months in the hospital unsure of how to go forward and lost. That was, until he received some wisdom. Mark first was determined to find employment where he could stay connected to the outdoors. So, he went back to school and got his degree in Park Management. He worked as a Park Ranger in various capacities, already shattering people’s ideas of what he was capable of, but that was just the beginning. He soon discovered the world of adaptive sports and threw himself into learning more and designing his own adaptive equipment to get back out into the field. It was then he came up with the crazy idea of climbing the sheer granite face of El Capitan. He found a partner, built an ascending rope pulley system, and started to train. Now, folks of many different abilities have climbed El Cap, but until Mark, this was unthinkable. He pulled it off and became the first paraplegic to make the ascent. Mark went on to gain tons of media attention, made national and international news, met the President, lit the flaming torch up a 120-foot rope at the Paralympic games in Atlanta; a fun story he shared with us, and continued on to break even more records of athletic achievement, like being the first paraplegic to sit-ski unassisted across the Sierra Nevadas. Listening to Mark describe his epic achievements it’s easy to forget he has a disability or about all the struggle that led him to this point in his life. But for Mark, it’s about mindset. But Mark wanted to share what he learned with others. He details the spark of an idea he had with a friend that led to the formation of the nonprofit, No Barriers, and the humble beginnings of an organization that is now becoming a movement. He uses his time to speak to groups and offer inspiration, as well as lead hands-on adaptive activities that get people out of their comfort zones. Dave: Well welcome to our No Barriers podcast. We are thrilled today to have Mark Wellman with us, who’s one of the founders of No Barriers. Can’t wait to hear some of his stories about what this organization was founded upon. He’s really the heart and soul behind why many of us are here at the organization. Before we get into that conversation, Erik, you just came back from a really interesting experience, why don’t share with our listeners a little bit about it? Erik: In a five by [00:01:00] seven room, had to kind of go into his mind and think about how to expand his mind. He said in his mind he married Halle Berry. They were married for 25 happy years. Dave: When was this set? Dave: That’s a lot of No Barriers. Erik: …authors right there. [00:02:00] Maybe we’ll get them on the podcast at some point. Dave: That sounds like perfect fit for the kinds of topics we explore. Erik: Yeah. And I am totally thrilled… this is great. I’m so psyched to have my friend, all our friends, Mark Wellman on the podcast today. Erik: The legend, the dirt bag… is that okay to say? Dave: You embrace it, right? Mark: It’s great to be here. I embrace everything. Erik: Mark almost doesn’t need an introduction, but Mark is [00:02:30] a world class adventurer, and an innovator, and is the key founder of No Barriers. Has done amazing things that blow your mind as an adventurer. Has skied across the Ruth Gorge. Has traversed the Sierra Nevada mountain range. Has mountain biked the White Rim Trail. Has climbed El Capitan, Half Dome. We were just talking this morning, your Half [00:03:00] Dome ascent was 13 days? Erik: On the wall. Just, Mark, a hero of mine for sure. You’re a few years older than me. When I was a teenager and you were just a little bit older climbing El Capitan and doing all these amazing adventures, you were a huge part of my motivation, so I’m psyched right now. Mark: It’s great to be here, thanks a lot Erik. Yeah I guess I could [00:03:30] start off with… 35 years ago I was an able bodied climber and we were climbing a peak called Seven Gables, which is pretty close to the Mount Whitney area. We had a 20 mile backpack to get into the base, and this is back in 1982, I was 22 years old. My good friend Peter Enzinger and I were back there to do this climb. [00:04:00] We set up a base camp about 10,000 feet, and the next morning we got up pretty early, grabbed our technical rock climbing equipment and left most of our provisions at the base camp, our sleeping bags. Sure would have been nice to have that sleeping bag with us but didn’t have it. And we climbed Seven Gables. It was sort of technical, kind of a mixed route. There was a little bit of ice, a little bit of rock, and made [00:04:30] the ascent. By the time we topped of it was a little bit late in the afternoon, about five o’clock. We just embraced this beautiful view from the summit. American Alpine Club places sometimes these cairns, or climbing registers, at the top of the mountain. It was kind of cool to see this. In this case it was just a pile of rocks with a Folgers coffee can. And I opened up the Folgers coffee can and dumped out the little pieces of paper, and there’s my [00:05:00] hero Royal Robbins had climbed it. “Cool man, I’m gonna put my name next to Royal.” Did that, and then we decided we’re gonna go down a class four descent on the backside, just scrambling, not roped. We were just kind of walking down a tail of slope. I’ll be the first to kind of admit my guard was down. My partner said, “Hey, maybe we should put a rope on [00:05:30] this one section here.” I go, “No, no. I wanna get down to base camp, I’m really hungry. There’s some really good freeze-dried food I wanna eat.” You know that wonderful Mountain House stuff. Erik: And 35 years ago. Mark: So next thing I knew, I slipped on some scree, and I pitched forward and I started rolling. I made a couple of somersaults and I rolled off about a 100 foot cliff. When I landed I broke my lower back at T 11, T 12. Of course at the time I didn’t know it. [00:06:00] I was 22, I didn’t even know what a wheelchair was. That happened, and my partner thought I possibly could have been killed. But he heard me yell back at him. He got down to where I was… he said he spent a couple hours with me stopping some bleeding on my legs, and some other stuff. Mark: He said he was with me for two hours, it felt like ten minutes. Mark: And then he left. [00:06:30] He left an orange, an extra jacket, and some trail mix and said “Man, I gotta get out and get some help.” So after 30 hours, the best sound I’ve ever heard in my whole life was the sound of this… [helicopter sounds] …coming up the canyon. Erik: You almost froze to death. Mark: It was cold that night. Yeah it was real cold. I was laying on some ice. That probably helped because it kept the swelling down in my back. So I’m an incomplete [00:07:00] para. I have a little bit of movement in my legs. They said that might have helped me, the swelling. But the helicopter got up there, it was actually a ship from the Forest Service. They were gonna just go up and see if it was more of a body recovery, but fortunately I waved to them and the helicopter disappeared. About an hour later, a second helicopter came up and this time was from Lemoore Navy Base, and they did [00:07:30] a technical rescue. Flew in, brought the rotors within several feet of the cliff surface, lowered a navy medic, got me in a stokes litter, got me back up into the ship. I was down at a trauma center, they were cutting my clothes off, and a nurse said, “Who’s your insurance company?” And fortunately I did have insurance, I had Kaiser. I went through stabilization of my back with Harrington rods. I was in the hospital in 1982 for seven months. Erik: More time is better, right? I mean, [00:08:30] would make sense right? You can develop more time? Mark: Yeah, a little bit. I think seven months was a little excessive. Mark: But you know, there’s a lot to learn. Your life has really changed. Your spinal cord runs your body, and you’re paralyzed from your waist down. You have bowel and bladder issues. You have skin issues you have to be careful about. So all those things were really important, and I had this one [00:09:00] physical therapist who was from Germany and she goes, “You need to train like you’re training for the Olympics.” I just really took that to heart and started lifting weights. Was ambulating with long leg braces. This was sort of the beginning of the wheelchair revolution where wheelchairs weren’t a stale piece of medical equipment, they were a lightweight piece of aluminum that was more of an extension of your body. And the wheelchair [00:09:30] could take you from point A to point B. Fortunately, in 1982 was really when these wheelchairs… they started making lightweight chairs. And I was a part of that. Erik: Not the clunky Vietnam-era things, right? Mark: Exactly. The old Everest and Jennings chairs were more obsolete, and they were using… well there was a woman who started Quickie wheelchairs, Marilyn Hamilton, she got hurt in a hang gliding accident. They took hang gliding technology, clevis pins, aluminum, powder coat. [00:10:00] And they kind of messier of manufacturing these wheelchairs sort of like… taking the technology from hang gliders and applying it to wheelchairs. Erik: We’re still less than ten podcasts in here, but we’ve already heard a lot of stories of people… these No Barrier stories of people who go down deep into these dark places. I don’t want to bring you down, but you have a lot of experience right now and so you can look back. You went to a dark [00:10:30] place, obviously. She took me down to Fort Funston where I met a ranger who kind of showed me the ropes and said “Hey, you could maybe do a job, this would be an entry level position, but you could help us plant dune grass and work in the nursery, or you could go to the entrance gate and help out there.” [00:11:30] So I did that for a summer and then I went back to school and went to West Valley College and studied park management. Mark: And became a ranger at Yosemite. I remember my first job wasn’t exactly my idea being a ranger. There I was sitting in this little kiosk, this little booth, at Big Oak Flat, the entrance to Yosemite. In those days it was a three dollar entrance fee and I’d collect the money and be breathing in auto fumes all day long. That really wasn’t [00:12:00] my idea of being a ranger. But it was entry level. The next summer I went down to Yosemite Valley and started working at the visitor’s center doing interpretation. Interpreting the natural processes of the park, the public. Bear management, geology, climbing was a big subject too. I’d give programs on climbing, talk about A climbing versus free climbing. Mark: I was, I was. I would start my climbing program off with my accident, actually. And bring that in, because I think that was a big part of it. They might say, “Well who’s this guy in a wheelchair, what does he know about climbing?” I’d kind of bring that in. That was before I climbed El Cap, I was doing those things. Jeff: Were you percolating on doing something like that when you were there? Mark: I was. It’s kind of an interesting story. There was a magazine called Sports And Spokes, it was a wheelchair [00:13:00] athletic magazine. On the front cover on that magazine was a DSUSA chapter, a woman who was being lowered down a cliff in a wheelchair on a river rafting trip. The river went over a waterfall, and then you did portage all the equipment around the waterfall. They had a swami belt and a climbing rope and they had a helmet, I guess they wanted to put a helmet on her for safety, sounded like a good idea. And they lowered her down this cliff in this wheelchair, [00:13:30] and it was on the front cover of this magazine, Sports And Spokes. I got the magazine at my little cabin in Yosemite and I had it on my lap. I was wheeling over to the visitor center to open it up in the morning, and I bumped into my future climbing partner Mike Corbet. And Mike’s nickname was Mr. El Cap back in the 80s, he had climbed El Cap more than anybody else in the world, over 50 times. And Mike had never really talked about climbing to me because he knew that’s how I got hurt. But when [00:14:00] I showed him this picture, Mike’s eyes got really big, and he got really excited. He goes, “You know what Mark, I wanna start climbing with you, but what I really wanna do is climb El Cap.” And we had no idea how we were gonna do it. Mark: That evening, we were sitting at the mountain room bar, we might have had a beer or two. Jeff: That’s where all good decisions are made. Dave: The truth comes out. Jeff: Hey, we’re all friends here. Dave: Oh that was lingerie? Not chaps. Jeff: This was the first No Barriers improv meeting, what you’re talking about, with your buddy Mike. Jeff: 88. There you go. Mark: Yeah 88. I was 28 years old. Erik: So if you think about it that way, No Barriers began in the Ahwahnee bar. Jeff: Yeah, on a bar stool. On a bar napkin. Dave: I know you guys are all dirt bag climbers. I’m not a dirt bag climber. For our listeners who are not dirt bag climbers, someone paint a picture, because we’re getting to the El Cap story. Which is a phenomenal story. Paint a picture of El Cap for us, because not everyone knows what that is. Jeff: Yeah, well. El Cap [00:17:00] is probably the most revered, iconic, monolith in North America if not the world. Uninterrupted, over 3000 feet of granite. It is… when you’re in Yosemite, you look up at it and it’s got this perfectly symmetrical flank apron on both sides that comes out into this promontory called the nose. And [00:17:30] you can’t take your eyes off it. If you look away for a minute, you have to look back at it just cause it’s so magnificent and powerful. And it represents so much too. If you want to call yourself a climber, you kind of have to climb El Cap at some point. Erik: When you stand in the meadows below, which is just clogged with tourists just all driving by gawking. What I’ve heard, is you have to look up and up and up, way higher than [00:18:00] you think you have to. Jeff: Erik and I climbed El Cap. And his dad, Erik’s dad, and future wife were down there in the meadow with telescopes watching us. We had one of those little lighty things, little sticks, and we were shining our headlamps down at everybody. It’s [00:18:30] a magnificent thing, but it’s also very intimidating. It can be very cool when you stand up and look at it, but then the idea of going and climbing it I think is a whole different story. Mark: Yeah, we had kind of a mixture of both. People that knew us, were “Oh yeah you guys should go do this.” Mark’s been training, he’s always skiing, always riding his bike, hand bike around… well in those days it was more of a row cycle. And then we had people say, mainly not to me so much but more to Mike, “Are you crazy? Take this paraplegic guy up El Cap? Seems like a really stupid [00:19:30] idea. Something could go wrong.” But fortunately, we didn’t really listen to that. We just started training, we made these rock chaps. Like I said, they kind of just evolved over about a six month period. We kind of have a little circuit in Yosemite Valley that we climbed together. We did Jam Crack, the Prude, Warner’s Crack, The Rostrum, we went over there. Mark: So we did some stuff in the Valley [00:20:00] just to really warm up. And then I actually went up and spent a night on El Cap. Because we wanted to feel what that was like. Mark: We actually went to Heart Ledge. Jeff: Over on the south. Mark: It was overhanging… once you get over the shield roof it’s overhanging. The beginning of it’s not. It’s pretty low angle. Jeff: Were you scared at all before you did this or [00:20:30] were you just super fired up and kind of naïve? Mark: I was scared the night before. Erik: Start on the ground and zip up 800 feet and have like a jumpstart on this gigantic monolith. Mark: Exactly. And have all your water, all your gear up there. So he had to work three or four days to make that happen prior to us [00:22:30] leaving. Once we left Mammoth Terrace, we were on our own. We went through the Gray Ledges, and we went over… the roof was really tremendous. Because Mike is basically climbing upside down, and then gets up onto the pitch above it and fixes a rope. Then I kind of untied myself and I swing underneath that roof, and you can hear the cheers of the people down below. It’s like [00:23:00] what Jeff was saying, It’s quite a scene at the El Cap meadow. You really have to have binoculars. It’s hard to see climbers up there, because they’re so tiny, they’re like little ants up there. If you don’t know what to look for, it’s hard to see these people. The crowd was yelling, and the green dragon would come by. It’s a tour vehicle that has it’s open air shuttle. Mark: We could actually hear them talking about “Mike Corbet, Mark Wellman, first paraplegic…” So that was kind of interesting. Finally when we topped out, it was seven nights, eight days of climbing. This was before digital technology on El Cap, when national news came out. They had a mule train, they brought out a satellite dish that was like five feet wide, and we were live on top of El [00:24:00] Cap talking to Tom Brokaw. Mark: And we’ve got… between the Today Show and NBC News, and in a week we were on TV for like several hours if you took all the time that they played this. There wasn’t really much going on in the news, so they really kind of played this story up in a big way. As soon as we got off that climb, about a week later, we’re sitting in the Oval [00:24:30] Office talking to President Bush. It was myself, Mike Corbet, “Writtenaur” who was Secretary of the Interior, and Jack Morehead, superintendent of Yosemite. The four of us are in the White House, in the Oval Office, talking about bone fishing because President Bush loved to bone fish and we presented him with a flag that we took with us on the climb, and it changed my life. Erik: Mark, so you’re not that old, but I see [00:25:00] you sort of as the father of adventure sports for people with disabilities. 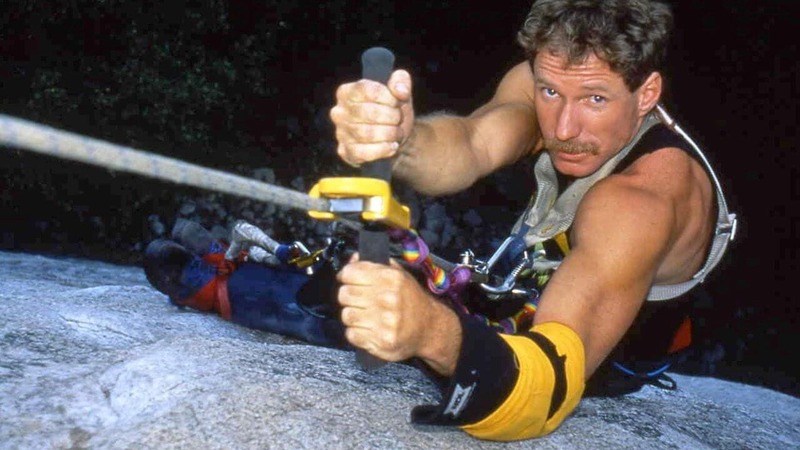 I want people to understand that the idea to climb El Cap back in the 80s… nowadays, I think… how many people have climbed El Cap in chairs, paras? Erik: But you sort of unleashed that. You opened up this door. And now, quote on quote gimps are doing everything, right? Mark: Every summer there’s [00:25:30] a paraplegic. Erik: But you opened that door for all of us. So, it’s sort of a crazy thought to me. Mark: It is. You can’t take the first ascent of El Cap, you can’t take that away from me. That’s something I’ll always remember. It was a huge accomplishment for both Mike and I, and there’s been different paraplegics who have gone up it. A gentleman with cerebral palsy, Steve Wampler, was probably the most [00:26:00] disabled person that’s been up there. Lots of amputees. I call them amputees, hardly disabled. Paraplegics wanna be amputees. Erik: Those will be our first complaint letters. Mark: Quadriplegics wanna be paraplegics. Everybody has their differences. There’s been a quadriplegic, incomplete quadriplegic, climbed El Cap with Tommy Thompson, good climber. [00:26:30] Steve Muse. Erik: There’s that kid who climbed The Chief, he was inspired by you. Erik: He was a quad, and he climbed The Chief. He invented kind of this, almost like a contraption with wheels if I remember right, that kind of rolled up the face. Mark: Yeah it was… the premise was taking the Dolt cart. A climber by name of Dolt had this cart and he used to use it for a hauling system on El Cap. Brad “Szinski”, the Canadian guy you’re talking about, he came up with this [00:27:00] cart. His hands didn’t really work as well as a paraplegic, he lost some muscle mass in his hands and fingers. So he had a different type of system where he could ascend a rope using a crank, and developed that. So there’s been all kinds of different adaptations that allow people that are wheelchair users to go rock climbing. Jeff: Yeah thirty five years. Now you’ve continued this trajectory of being this pioneer when it comes to just making it work. You make it work, right? Mark: I was so young. When I got hurt [00:28:00] I was 22. I wasn’t climbing big walls, I hadn’t got to that point yet of climbing El Cap. Finally, when I did have my accident it kind of made sense. The steeper the climb for somebody in a chair the better. Mountaineering is gonna be really tough. There are ways of doing mountaineering. We got four paraplegics on top of Mount Shasta. Erik: That was a pod that they were in, that had almost like tractor wheels, right? Mark: Exactly. What we did is we took a snowmobile and cut the snowmobile track in half and made a tractor stance. So you have two tracks and a seat with a bicycle crank, and we actually crank our way up Mount Shasta. We had to get special permit from the Forest [00:29:00] Service. You can only be on Shasta for three days, and we knew we were gonna be up there for a week. So I had to drive up… I was trying to explain to this district ranger on the telephone, he really wasn’t getting it. Erik: Sometimes they don’t get it. Mark: Right. He knew who I was, so he said “Come up and bring the machine with you so I can take a look at it.” So I brought one of the snow pods up there and I met with the district ranger [00:29:30] and a couple of his back country rangers, and they got it. They said, “This is cool man, we’d like to let you guys do this.” They gave us a special use permit. The big thing about the Forest Service and wilderness, or National Park Service wilderness, you cannot take… supposedly mechanized devices cannot go into the wilderness. But if you have a disability, your bicycle could almost be considered a wheelchair, or your snow pod can be considered [00:30:00] a wheelchair. Long as it doesn’t have a Briggs and Stratton engine on it. That was the big thing, it has to be a manual piece of a gear that’s human powered. So we got that, and we got four paraplegics on top of Mount Shasta. Erik: And El Cap really launched you into being able to do all these amazing things, right? You pretty much became a professional climber, adventurer, doing these things around the world. I know you lit the torch for the Paralympics, right? Mark: So I said, “Let’s make this torch holder so it comes off your legs.” So they made that for me. That night we’re training, I get up the 80 foot rope, and I lit the fuse and the fuse blew out. Mark: And the pyrotechnics guy goes, it was windy, and the [00:31:30] next day it was gonna be windy too. So the pyrotechnics guy guys… “Okay Mark, I’ll make sure this fuse doesn’t go out the night you do it.” And I go, “Great.” So I get up there in front of 80,000 people, I’m climbing up this rope. Liza Minnelli is singing this song and she’s going “Go Mark, Go Mark.” The whole stadium of 80,000 people is going nuts. So I lit this fuse, and literally the thing blew up. There was fire all over me. And I’m leaning back, hoping I’m not gonna catch [00:32:00] on fire. Then the fuse went up and lit the actual cauldron, and that was the start of the 1996 Summer Olympics. Jeff: You did not combust. Mark: I did not combust. I had the best seat in the house. Erik: You’d be like a Motley Crue drummer. Mark: Exactly. So that was fun. Erik: Takes us on a little tour of what you did. All those amazing adventures that you did after that. Takes us on a little tour around the world. Mark: What a lot of people don’t realize, which I think is harder than climbing [00:32:30] El Cap, or spending 13 days on Half Dome was another big ascent we did years ago… but was doing the Trans Sierra ski crossing. I’ve done it twice now. I did it in 1993, it was a big winner, and I did it in 2011. So we took a cross country Nordic sit ski. You sit low to the ground, you have two skis mounted underneath a frame with a seat, and you’re sitting maybe a foot off the snow. And you have two [00:33:00] poles, and you actually double pole. So you’re double poling to make this device go down the trail. I was on the US Disabled Nordic Ski Team. Competed in two Paralympics, in France and in Norway. Got beat up by the Finns, the Norwegians, they’re so passionate about that sport. Mark: And they’re vikings, man. They’re so tough. My best finish out of 30 guys was of fifth place, that was in France. [00:33:30] In Norway, I got even more beat up. I wanted to actually get into Nordic ski racing because I had other things I wanted to do. I wanted to try to get into the back country in a Nordic ski. Back in 93 a guy named Jeff Pegles and myself was also on the US disabled Nordic team. We took sleds, little polks, behind our rigs. We had our bivy gear. And we skied 55 miles from Snowline [00:34:00] on the east side of the Sierra on Tioga road, we got someone to open up the gate. Guy that worked for the power company opened up the gate. We got up to Snowline and we skied from Snowline to Crane Flat, which is 55 miles. Mark: Following the Tioga road. Jeff: Just the two of you? Mark: Well we also had Pearlman with us too. Mark: He was filming, yeah. Erik: And, you gotta tell the story about the White Rim. So you biked the White Rim, I think you were on one off mountain bikes? Mark: It was an epic, groveling adventure. Seems like everything I do turns into that. Mark: If you’re not suffering, you’re not having a good time. That’s kind of how it is out there. We had these one off mountain bikes and [00:35:00] we actually did a Jeep tour to kind of check it out a couple years prior. We did have it a little easier, we didn’t carry all our water and food with us, we had a swag wagon out there. Suburban, follow the four paraplegics. Myself, Bob Vogel, and Steve Ackerman. We rode this, 52 miles is the full circumnav of the White Rim. There was times, [00:35:30] yeah, it was an interesting experience out there because some of these washes were like moon dust. We couldn’t get our bikes through it. So I had a pair of rock chaps with me and I threw the rock chaps on and did some crawling. Had an 11 mil static rope and dragged the guys behind me. Did a few epic things like that. Jeff: I mean, If I’m riding my mountain bike and I come up on that scene in the middle of the White Rim, who knows what to make of that? Mark: [00:36:00] You can walk man, so best thing to do is just walk your bike. Jeff: There’s nothing to see here. Yeah. Mark: And then recently, just a couple of years ago… in the winter we had a drought in California and Tahoe, so I circumnaved Lake Tahoe in a kayak in winter. And that was a really amazing adventure. It was 72 [00:36:30] miles, two nights of camping. But the cool thing was, and it was cool at night, it was really cold at night. There was no power boats. In the winter you don’t have any power boats on Lake Tahoe, it was kind of like being out there in the 1800s. Seeing bald eagles, none of the tourists were on the water, it was really a fantastic trip. Dave: So Mark, you are someone who really embodies the spirit of No Barriers and you helped [00:37:00] start the organization. So tell us, all these adventures, all these things you’ve done to challenge what’s possible, what people think is possible. Why No Barriers? Tell us that story. Erik: Climbing the Fisher Tower. Mark: Yeah. The Fisher Tower. Ancient Ark. Erik: I remember the chair operators didn’t even know how to get people with disabilities on the chairs. Mark: They didn’t have [00:39:30] an idea. They didn’t… yeah. Erik: On the ski lifts. Thank you. Yeah. Mark: They weren’t doing adaptive skiing in those days in that little village. It was actually the home of the 1956 Olympics. SO that was kind of my envision was to start this, and who knew it was gonna get into what it is today. It’s just amazing what you guys have done, and all the different things No Barriers has to offer people. Mark: [sighs] It’s kind of mind boggling how it’s grown so big and how many different people it affects, it’s not just the disabled community, it’s able bodied community bringing everyone together. Trying new experiences. The youth programs [00:40:30] that you guys have been doing is tremendous over the years. Soldiers to the summit. We’re having all these guys coming back doing ten tours, they’re not adjusting back into society very well, and taking them out into the outdoors with Jeff and different mountain guides, it just changes their lives. Brings them more back into a reality where they can really kind of adjust back into society. And then the summit is just… I love [00:41:00] coming to the summits. I’ve been to every one now, I haven’t missed one since the beginning. It’s gonna be fantastic in New York, I’m really looking forward to that. Erik: And you bring your climbing wall, your portable climbing wall. Erik: Almost to every summit. So that’s your mission now, right? To go around and use your climbing wall as a No Barriers tool to help people break through barriers. Tell us about that. Mark: Absolutely. Climbing has been such a big part of my life, that I just like to introduce different [00:41:30] people to the sport. A lot of times, somebody that’s… we don’t say electric chair, electric chair is something you die in. Power chair. A power chair takes you from point A to point B. A power chair user, a lot of times doesn’t have all the… there’s not as many things out there for a power chair user to participate in. Climbing on my wall, they can. We have these harnessing systems [00:42:00] that support your core. It’s almost like a Bosen’s chair, pulley system. If you have the desire to get on the climbing wall, we can facilitate that. We don’t turn anybody away. We’ve had people that weigh 500 pounds on my wall before. Very obese wheelchair users… it doesn’t matter. I had a gentleman that had spina bifida and he was unfortunately caught up in the American society of drinking a lot of soda, [00:42:30] and became really big. We got him on the wall, it was really difficult for him. We would talk to him and he wouldn’t really look at you eye to eye as we were talking. I saw him a year later, he dropped 150 pounds, quit the soda, got into a training, cut his hair in a mohawk, and it just changed his life. Got out of the power chair and was in a manual chair. So climbing was kind of the responsibility of really changing this guys life, and now I see [00:43:00] him down in Los Angeles. I probably take the wall to Southern California maybe seven or eight times a year, San Francisco, Bay Area. I sort of have different groups hire me year after year, once they experience the wall they really want to have it be part of their event. We bring in, mini El Cap I call it, and we get people on it and we have a great time. Erik: And you’re traveling around with your wall, full time. People bring you in to create this experience for their [00:43:30] rehab hospital or organization or team, right? Mark: Exactly. All those venues… I do adaptive climbing seminars. So a gym might call me and wanna know, “how do we get an adaptive climbing program going?” So I do that. And a lot of times I’ll do not only a seminar on adaptive climbing, but then maybe that evening do a show and tell about adventure sports and where adventure sports have taken the disabled in the last 35 [00:44:00] years. Mark: Yeah, it’s… yeah it’s kind of getting that way. Jeff: You’re like Beyonce now. Mark: I’m like Beyonce. It’s just kind of neat that my passions over the years… everybody should have a passion. And my passion has always been [00:44:30] to be out camping, doing something in the outdoors, coming up with new ideas, new technologies… and some of these technologies are more like a backyard technology. It’s not that fancy. Sometimes some of the most simplest things can change something. Like mountain bike tires on a wheelchair can change a chairs getting into the back country tremendously. Mounting a pull up bar in a sender can allow a paraplegic [00:45:00] to do 7000 pull ups in eight days to go up El Cap. Just simple little technologies can really change peoples’ lives, and you can take that backyard technology, garage technology, put something together that works for you that can help a whole bunch of people. Erik: Yeah, you’re de motivational. Mark: Right, right. I know, I get it. Mark: I think it’s really important for people to get out of their comfort zone. Nowadays, it’s so easy for young people to get… they get into gaming. And they [00:46:30] just, you know… it’s stagnant. You’re not getting out of your comfort zone. And the outdoors has a way of getting you out of your comfort zone. And you can make it safe… you don’t need to think about what I do, it’s more about finding, maybe getting some different experiences. And that’s what’s so cool about the summit. You have all these different activities going on where you just get a little taste of it. And hopefully [00:47:00] that little taste will inspire your imagination to want to try it again. And that’s where I think it’s really important if you’re facilitating skiing or climbing, or whatever you’re facilitating, you have to make sure that these people, their first experience is a good one. If they don’t have a good experience, most likely they’re not gonna go back to it. And, it’s really important that the very first time… One of our board members, Sasha. [00:47:30] He was an academia guy, a professor. He came to the No Barriers event in Squaw Valley, the first one. Never had tried climbing before, and we took him to Donner Summit and got him up on this road cut climb that’s 80 feet with big exposure, and it changed the guys life. It was something he was real nervous about, but it was getting him out of his comfort zone, and him [00:48:00] really having, you know… it was exciting for him, it was thrilling, it was challenging not only physically but mentally challenging at the same time. All those things combined. Kind of changed his life. And he became a board member of No Barriers because of that. Mark: And there’s stories like that all the time. Or Mandy, I remember her… wonderful singer. She got on my wall, it was 25 feet, and she [00:48:30] was really scared. It was a really scary moment for her where she had this big fear of heights. It wasn’t like she was on a 1000 foot rope, she was on a 24 foot wall. But she might have well have been. Erik: Get into the finals, and now skyrocket into stardom. Mark: To fame. Absolutely. Making a better quality life for herself. [00:49:30] A lot of times when you say, somebody that’s a wheelchair user… what is it, like 90 percent of the people in wheelchairs don’t have jobs. And it’s always kind of bummed me out, I’m thinking, “Wow.” Why would you wanna be caught in a system like with Social Security and be basically poor your whole life, because “Oh I have Medicare, I have my Social Security disability,” So you’re trying to live on six to eight hundred dollars a month. And you’re caught [00:50:00] in this kind of vicious circle. You’ve got to get away from that somehow, and get into the workforce, be productive. You’re gonna feel better, you’re gonna be a more productive citizen in this country, and you’re not gonna be wrapped up in this vicious circle of never getting ahead and always having the government thumb you down, so to speak. Erik: Last question for [00:50:30] you from my end, this is Erik, and I wanna know, I’ve made it kind of clear that I look up to you. Tell me, who are the people that you look up to? Tell us about that guy Larry, tell us about some people who influenced your life. Mark: Oh man. There’s been a lot for sure. There was a guy named… actually I think you’re thinking of a guy named Mark Sutherland. When I first got hurt, Mark was a quadriplegic ten [00:51:00] years post to my injury. And he was back in the hospital. He had a bone spur, the spur was touching his spinal cord, and he was losing some of his action. Some quadriplegic can move their arms and they can push manual chairs, and he was one of those. But he was losing some of his arm strength, so he was in the hospital, and my room was next to his. We would talk at night. ‘Cause I was really bummed out when I was first injured. To me, being a paraplegic was a fate [00:51:30] worse than death. I was on the sixth floor, if I could have crawled over to the window and jumped out I would have cause that’s how bad I felt. Jeff: Showed you it wasn’t a death sentence. Mark: Yeah. Showed me it wasn’t a death sentence, and let’s get on with life, dude. And it was like, boom. That just changed me. Then we went into rehab together, we were more in a hospital setting and then we both went into our physical rehab. That’s [00:53:00] when it just started clicking for me, and that was it. Dave: Well, just to wrap up this excellent conversation that we’re having about the history of No Barriers and all that you’ve done as well just individually, you’ve seen No Barriers be this thing that started in the Dolomites in 2003, we’re 15 years into this. What’s your dream for what it becomes? Mark: Wow. I would just consider it to be… I’d like to see maybe a couple summits a year, possible. [00:53:30] More, smaller clinics would be really cool too. I think you guys are really on a good, good path. But maybe some smaller events too. Just keep growing it. Keep doing more of these kinds of things. More technology. Bringing in more people, better speakers. Better people that are… or people that are doing more things that inspire others that give the ideas [00:54:00] to do more things. I’m amazed in 15 years where it’s come to. Who knows where it’s gonna go. Another 15 years from now, man this could be a huge, huge organization that could affect a lot of people and bring a lot of people together. This whole family, bringing the tribe together. It’s always fun at the summits, and seeing people I haven’t seen for a year, [00:54:30] spending time with them. I love getting people out climbing, so that’s my passion. Erik: What if people want to learn how to get in touch with you, how to work with you, how to bring your wall to their organization? Mark: Yeah. Google Mark Wellman or just go to my website, No Limits Tahoe dot com. Give me a call. Erik: Although they won’t talk to you, ’cause you’re never home. You’re always out [crosstalk 00:54:55] or something. Dave: Always on the road, right. Mark: Well, no, yeah I’m easy to get a hold of. Talk to my wife, Carol, [00:55:00] and I can get back to you. Mark: Send me an email. I’m better on the phone, I don’t like to email tons. Love to talk to you, if you have ideas lets talk about, lets see you at the summit. Lets get out and enjoy life. Erik: Cool. Well thank you so much Mark. Jeff: Listen Mark, I know you well enough to know you don’t need to hear what I’m about to tell you, but, I think it’s important for you and the listeners to know [00:55:30] in conversations like this, it becomes so clear how you are sort of the upside down pyramid. And you’re the point on the upside down pyramid. And it all sort of funnels up from you, really. And I know there’s others, but you’re the man. And I know it’s important for you, it is important for me to know that you know how many thousands of lives you’ve impacted. Jeff: Thousands of lives dude. You have been the kick starter [00:56:00] and the imputes. And you’re just one of the most wonderful pioneers. I know you know it, but you need to hear it more, because you’re the man. Mark: I appreciate it man, it’s humbling. And, to take a passion that I had and a dream… and like I said, just simple adaptations, a pull up bar on a jumar. Man, how that changed other people to go climb up El Cap, or do Castleton, or whatever [00:56:30] mountain you want to get up, it’s been a pretty cool experience. It’s been fun to work with other companies. We’re making more adaptive climbing equipment now. It’s really kind of evolved from just handmade rock chaps to a real sophisticated pair of rock chaps that allows people to get out there and do a lot of cool stuff. Dave: Well it’s been an honor to have you here Mark, I know many of our listeners are part of that No Barriers tribe. Many of them will know you, but a [00:57:00] lot of them won’t. The movement has grown so big that it’s well beyond you. But per what Jeff was saying, it’s so important I think for the people of our community to know where this began. Dave: And you are the point that Jeff mentioned where it began, and so, thank you so much for joining us, we appreciate having you. Erik: What did you guys take away from that? Might take us a while. Jeff: Might be a lengthy debrief on that one. Dave: I guess for me, as someone who’s helping to build [00:57:30] this movement, like I was ending with there, just to remember the roots of where No Barriers began which is individuals coming together in small communities around creative ideas to do stuff that people didn’t think was possible. And as we start to move to tens of thousands, maybe millions over the next ten years of people that we impact, that there’s something in that special sauce that’s still about the [00:58:00] individuals getting together having a fun, creative idea and going out and pushing their comfort zone. Erik: Yeah. I think that, No Barriers recipe is sort of hidden right in the story of El Capitan, which is… Mark’s a smart guy, but he’s not a scientist or anything, he’s not Hugh Herr, who’s inventing stuff where you go, “I could never do that.” What he said is a pull up bar and a jumar. These are commercially available things. I think he had to adapt a few things, but [00:58:30] not all that crazy technology. Pretty simple. You combine that series, that innovation with the human spirit and a great friend or great support system, a great rope team, you do this amazing thing that opens up the door for a lot of people. It’s a pretty simple recipe. Jeff: All the big things that have happened with regards to our species all started with this small [00:59:00] germination of somebody sitting in their theoretical garage just being like, “How do I do this? Hmm?” And head scratch, and start piecing these things together, and then, boom, the movement begins. I think Mark embodies that, and what a great cornerstone for this organization. Dave: Well, and the movement continues. So if you’re sitting there listening saying, “I wanna be a part of this organization, I wanna be a [00:59:30] part of No Barriers,” please go to our website, No Barriers USA dot org. You can join us at the summit that Mark mentioned that’s coming up in October in New York. There are many more ways you can join us but please, No Barriers USA dot org is our website. You can also share our podcast with your friends and colleagues and families, and follow us on our Facebook page. Thank you so much for listening.